Definition of a bunion (Hallux Valgus); Abduction and valgus of the hallux, adduction of the first metatarsal and lateral subluxation of the first metatarsophalangeal joint. 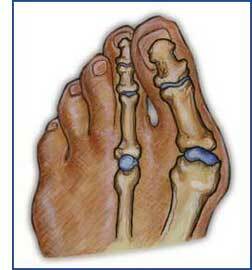 A bunion (Hallux valgus) occurs when the foot bone that joins with the big toe moves towards the centre of the body. When the big toe moves towards the centre of the body, a bony prominence on the side of the foot occurs. Bunions are more common in women than men. Women are more likely to get bunions because they often wear tight-fitting shoes. Bunions are generally preventable and treated by wearing more appropriate footwear. Bunions rarely require surgery. and pain along the inside margin of the foot. feet that are too wide to fit into their normal shoes. Yes. The easiest way to prevent bunions is to wear shoes that fit properly and or ORTHOTICS. When a shoe fits properly, the tops of the four smaller toes, when resting on the insole of a shoe, should be about level with one another. There are many different treatments for bunions. Medications, such as ibuprofen will temporarily relieve the pain and inflammation. Change in footwear is a more permanent treatment that will help the bunion symptoms. Commercial bunion pads, and bunion night splints can reduce the size of the bunion and ORTHOTICS to prevent further pathology. In rare cases, surgery is needed.